InSilMax™ and InSilMax™ XT extreme high temperature, heat and flame resistant fabric is used for equipment protection, welding curtains and blankets. Superior protection for weld splatter, molten splash, slag and sparks. Meets MIL-I-24244 and MIL-C-24576(SH) specifications. FM Approved Class 4950. This fabric has a minimum 96% silicon dioxide content, providing optimal performance. Made from amorphous silica. 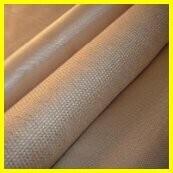 · 0.030" (18oz/sq-yd) and 0.054" (24oz/sq-yd) thick satin weave. · 36" and 60" wide roll width. Maximum 150 foot roll length. · Produced from an extremely pure silica base fiber (SiO2) and can be used at 1800F continuously with excursions to 3000F / 1650C. · 40" and 60" roll width. Maximum 150 foot roll length.